If you receive this blog by e-mail you might get it twice – sorry for that – but it should only happen once and the prettier version should be the one you receive from now on. I am just working out the bugs of a new system and all should be perfect by the next email. Thank you so much for subscribing! If you are not a subscriber, you can sign up at the top right and choose between the newsletter or the blog or get both! Enjoy the most recent chapter excerpt from my upcoming book. In early 2008, I was preparing for my first solo exhibition. It was only months away, nothing was working and I was starting to panic. What did I have to say? What was the purpose of my art? The fact that I found myself asking these questions this late in the game made me wonder what I was missing. I decided to go for a drive to clear my head… I wandered the back roads east of Gravenhurst and Bracebridge in search of – something. I drove for hours up and down Muskoka sideroads. As evening approached, the crisp afternoon –22C chill began to sink into deep January cold. Preparing to turn around and head home, I paused to enjoy the colours of the mid-winter sunset and found myself in front of an abandoned building. 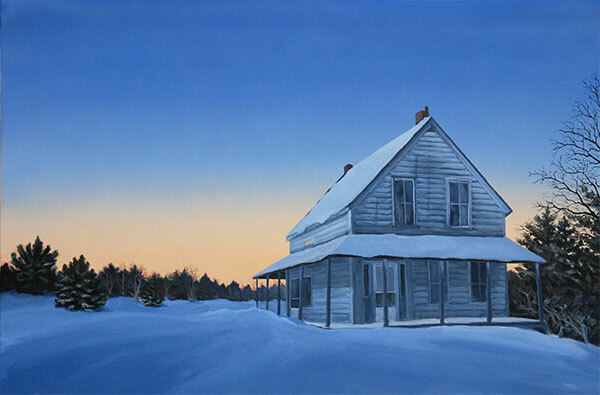 Cobalt blues chasing twilight swallowed the last remaining warmth of sunset and winter’s shroud wrapped seamlessly over the landscape broken only by a few trees and the graying house. The season’s silence as deep as the snow, white curtains concealing the deep teal of a now cold kitchen with measuring cups waiting to measure the weight and volume of time. As the light dimmed and the colours faded, I knew I needed to paint this place and tell its story. The painting “Twilight” was the beginning of not only a series of paintings, it was the start of a spiritual journey through the mysteries of our internal and external architecture – of the benign sorrows of life and death through the perspective of home. The nearly ghost town of Uffington straddles the crossroads of a flat plain with very little Muskoka granite. The bush is reclaiming the dormant fields of all but Bruce Johnson’s farm where horses keep the scrub at bay. The hotels of the history books are long gone and over 50 years have hidden the schoolhouse under a mantle of residential occupation. Nearly a year and a half after first discovering the little farmhouse in Uffington, I was privileged to meet Tom Iddison, the son-in-law of the Flegers, the last family to own the old house. I was immediately struck by his calm and generous nature. We spoke a couple times on the phone and in May of 2009, Mr. Iddison guided me through this beautiful, old family home. Earl & Dorothy Fleger in the 1960’s in front of the house. The house was built in 1900 as the Methodist Church Manse and was managed and eventually sold out of Church possession by Reverend Grover Livingstone, well known for his work and his stay as a patient at the Gravenhust Sanitorium. It changed hands a few times until Dorothy and Earl Fleger purchased it in the 1940’s after their Uffington Road burned down. The story goes that Earl was stockpiling his fuel during the Depression and the storage container caught fire taking everything, including their farmhouse on Uffington Road, with it. The first floor was pretty much rotted out. Like many farmhouses of its era, it was built on the ground without a stone foundation. The carpet hung like a hammock and supported our weight in all but a few places. 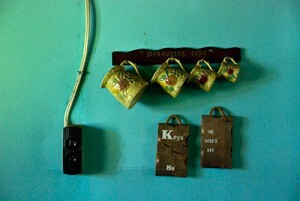 The teal paint on the walls was still in good condition. Measuring cups and a key holder still clung to their hooks beside the door. The stove was long gone and the stovepipe hole was stuffed with rags. The house had electricity, but never indoor plumbing. Water came from a well that was on the highest point of the property and hot water came from a reservoir on the woodstove. Tom put in a water line to the kitchen for “Mom”, dug out after the town well was contaminated by an oil leak. The Flegers loved to entertain. Many parties ran late on long winter nights and the alcohol would flow along with laughter and music. The lack of indoor plumbing in January had its drawbacks on a cold night. Once, an intoxicated guest wandered out in search of the outhouse, but never got past the porch. When Mrs. Fleger awakened in the morning for a trip of her own, she discovered one of her boots on the porch was full and frozen solid! The front window farthest from the stairs was Mrs. Fleger’s room. The base of the window was still packed with rags to block out the draft and when Tom lifted them, we discovered a large gap. I cannot imagine living in a house during the frigid Muskoka winter without central heating, indoor plumbing and hot water. Mrs. Fleger lived there into her 90’s without any modern conveniences besides basic electricity. Mrs. Fleger’s granddaughter Crystal’s favourite room was darkly paneled and contained only a wardrobe and a single chair. 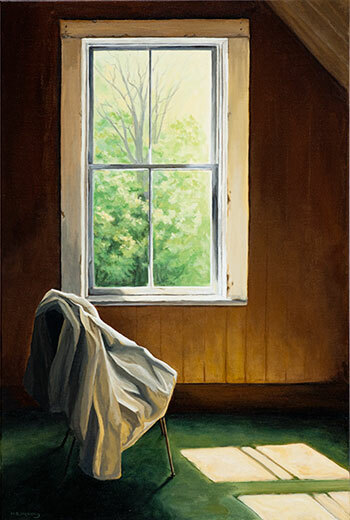 The chair sat next to the window just out of the sunlight, with an old vinyl coat tossed carelessly over it. By the door was a pair of her grandmother’s shoes that appeared to have been abandoned only moments before. I stopped for a moment to reflect on what we leave behind and wondered what it meant, if anything. While working on the “Twilight” painting, I noticed how the sky was reflected in a tiny window above the porch roof. It was horizontal and very narrow. It created a small contrasting flash of warmth in the midst of the cool shadows of the wall. Back in the days before electric lighting, this little window lit the dark stairwell. A small bear sculpture with a thin strip of tarnished brass with the engraving “Agawa Canyon” sat on the little sill on the inside of the sidelight. When Tom lifted the bear, a void remained in the dust and cobwebs where the animal had kept vigil over the quiet passage of time. 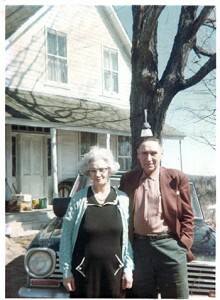 The house had been empty since 1999 when Dorothy Fleger was forced to move to town shortly before her death. Sadly Tom Iddison passed away in July 2009, only a few months after we met. The property was sold to Pete Marchildon and Judy Veitch, a family with deep roots in Muskoka. The old manse is being restored as a summer cottage further back on the property. Only months before, the plans were to tear it down. Instead, it celebrates it 113th birthday on a real foundation and hopefully many, many more. A good news story, wonderful that the house will be preserved. Always interesting to read about the artist process, the questions we ask about why. It is often better when we stumble upon something than when we try to work from a directive. I still remember how I first connected with you when you commented on my blog post about Margaret Laurence’s The Stone Angel. Thanks to you I came to know some of these old, ruined houses and buildings from historic Muskoka, and isn’t it that the film adaptation of The Stone Angel was shot there? Good to see you’ve a book coming up. Congrats on this chronicle of your artistic journey. I know that my mother in law has recently contacted you regarding the story you have on the Fleger House, there are 3 of the Fleger’s children still alive and able to tell the truth about the land, the house and growing up in it. Tom was a son in law of the family and was not brought up in the house. There are also 3 other grand children in the family, that were not mentioned but spent a lot of their time growing up on the farm as they all lived within a 5 minute walk from each other. I understand that you got the information from Tom and his children and it’s sad that they would not have included the main family in the story as they are the ones that worked and lived on the farm for most of their lives. I just wanted to let you know this information as I feel its only right that you are given the correct and proper information for a story. I would have loved the opportunity to speak to the rest of the family, unfortunately after repeated attempts at contact, no one would return my correspondence.